7 Comments on Go back to Africa! Statistics show that 149,000 British citizens emigrated in 2011; most likely in search of jobs. Britons left for various countries, with favourites being Australia and New Zealand. I suppose with the financial crumbling of Europe, what is the point in staying? With Asian and African economies booming, their British citizens are heading back to see if the grass is greener on the other side. A friend forwarded me an article by Afua Hirsch, West Africa correspondent for the Guardian newspaper, about Ghanaians in the UK leaving to go back and settle in Ghana. I thought this was quite interesting, especially as I know people who have done exactly that. Historically people usually go back home to retire but now the tide has changed and a younger generation are going back. Opportunity knocks but once and UK Ghanaians are not letting it pass them by. In 2011 Ghana had the fastest growing economy in the world! While on the surface this sounds great; since becoming the first black African country to get independence the road to prosperity has been littered with potholes. The Cedi – Ghana’s currency. The note has a picture of the ‘Big Six’, the men who lead the fight for independence (Photo: Ghanapedia). While things are looking bright for those from the UK seeking new pastures in Ghana, some anecdotal tales I have heard from locals include a lack of nurses in military / private hospitals; so patients’ families hire help if they cannot look after their sick relatives during their stay in hospital. If you go to any NHS hospital in London (or other parts of the UK), it’s highly likely that you will bump into a Ghanaian nurse or midwife, many of them left Ghana in search of job opportunities in the UK. Africa is a continent, not a country and I think it’s important to also look at development within each country, separately. While the news of Ghana’s rapid growth is promising and a step in the right direction, it needs to translate into physical development such as transport links, manufacturing and agricultural industries, clean running water for all 25 million inhabitants, not just a proportion of them. With African prints becoming more popular internationally, this is an excellent time for Ghana to develop her creative industries; produce woven Kente cloth on a global scale and sell internationally. Unfortunately Ghana has been slow off the mark with this and other countries like China have manufactured cheaper printed versions of the Kente cloth pattern for export. Ghana needs to own and take hold of her treasures. It is important for every country to have foreign companies but there are certain industries that Ghana can develop. While her history has not been smooth sailing, Ghana is considered to be one of the most democratic countries in Africa. Maybe with the influx of Ghanaians from the diaspora including the Unites States, this will ignite an evolving mentality which will enable the removal of obstacles to development that have been put in place, sometimes by Ghanaians themselves. 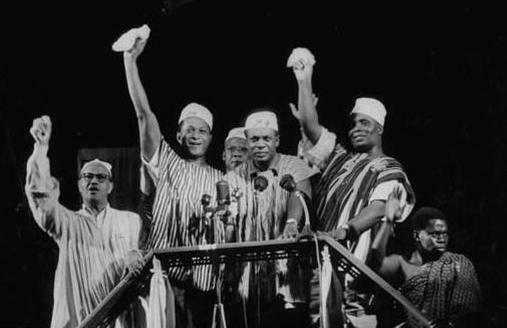 After shedding tears, Dr Kwame Nkrumah and his comrades declare Ghana’s independence. 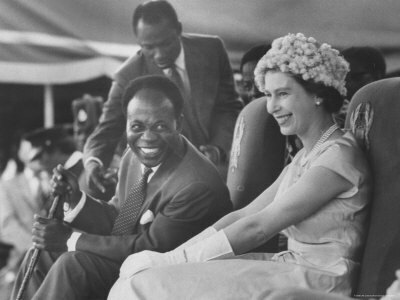 Dr Kwame Nkrumah and Queen Elizabeth II (Photo: BBC).